On July 14, our neighbors—Francophiles to the core—had their annual Bastille Day party. I offered to bring a dish, then racked my brain thinking of an appropriate “deguster” that would evoke the season and, more important, the country they were celebrating. The party hosts, Stephanie and Tom Teague, are drawn to France certainly because of the citizenry’s absorption with fine food, art and architecture, but also because of the special bond that the United States and France began in the Revolutionary War: Lafayette, Rochambeau and de Grasse are French noblemen who helped America achieve its independence from the British Crown. And when it comes to a special getaway for the two, there’s no place like Paris. “Every time I visit I bring back a new appreciation for both that city and my own country,” says Stephanie. Stephanie tells me Paris is transformative in a multi-layered way. “I learn something new on every trip about letting daily life be richer than my same old habits…whether it’s how the produce seller arranges the eggplants, or how people of all ages, shapes, and socio-economic strata manage to look so pulled together…it’s about the emotional depth and weight of the history all around you. Much like our American 4th of July, Bastille Day commemorates the storming of the Bastille in 1789, symbolizing the uprising of the modern nation of France. 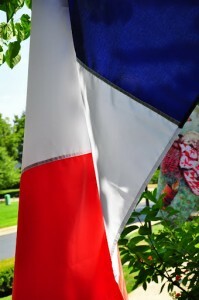 At Tom and Stephanie’s home, every July 14th the three vertical bands of the French tricolor —blue, white and red —is hung beneath Old Glory, and they invite their friends for food and drink, letting the good times roll. I decided to make a variation of tapenade, the traditional spread from Provence. Capers are essential to tapenade, indeed, the root of the word, tapena, is the Provencal word for capers. Olives are another absolute, but after that the rules break down. The ingredients may be pounded, processed or finely chopped; I’ve seen recipes that incorporate tuna and a Silver Palate Cookbook recipe that includes mayonnaise. 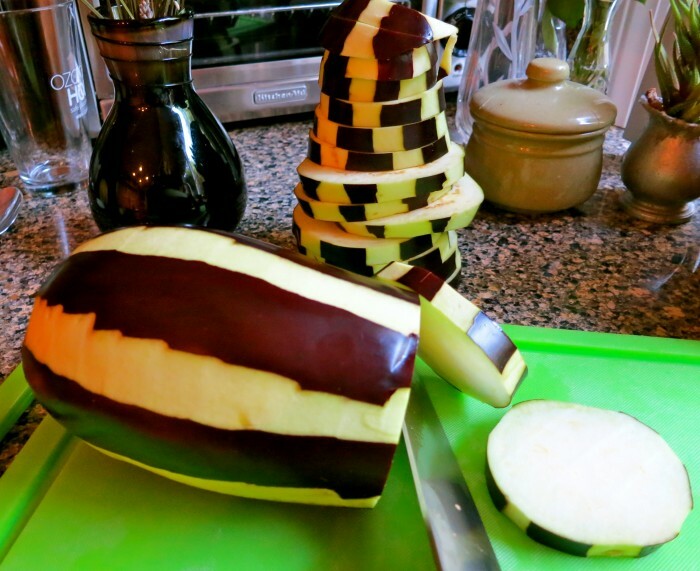 I decided to incorporate eggplant, which is coming into season, into the appetizer, as the assertive, rich taste complements the Mediterranean flavors in the recipe. Tapenade may be stored for days in the refrigerator and be used in so many other ways: tossed with pasta, spread over pizza, used as a base for a sandwich, or stuffed into a filet. 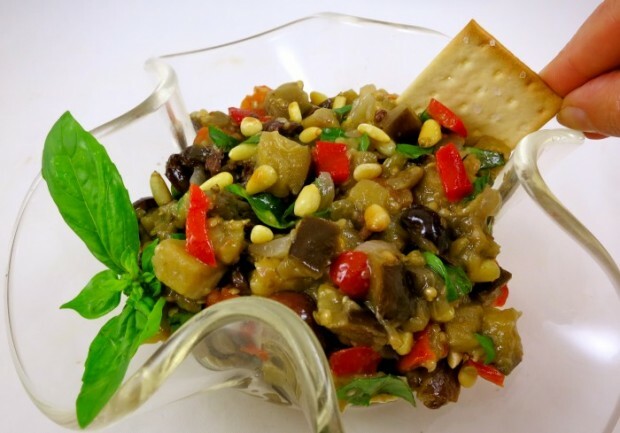 My addition of pine nuts was impulsive, and the appetizer takes a slight turn into Italian Caponata-land, but the sweet crunch of pine nuts lends a marvelous textural component to the recipe. Tom tells me the idea for their party grew out of a desire to play petanque (a popular French game of balls) and show the 1935 Ronald Colman version of “A Tale of Two Cities” on the back patio to their friends. 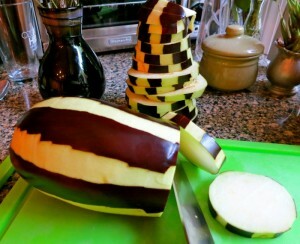 Cut eggplant into 1/2-inch pieces. Heat oil over medium heat. Saute eggplant and onion until very tender, occasionally stirring, about 20 minutes. In last five minutes of cooking, stir in garlic and red peppers. Remove from heat and stir in capers, red wine vinegar, and olives. Mixture may be refrigerated up to 24 hours, at this point, before serving. When ready to serve, stir in basil and pine nuts, if using. Best served at room temperature.